If you can't have a credit card, or don't want one, you may find that it's hard it make online purchases, or shop where you need plastic. A Visa or Switch debit card might be the answer, but having one of the many pre-paid cards that are on the market, could be a good idea. 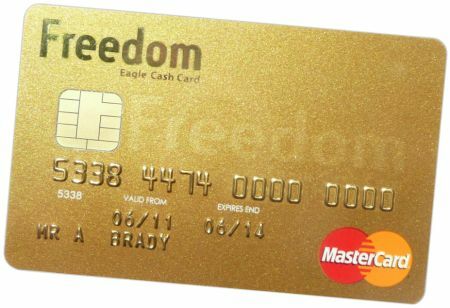 The Freedom Eagle Cash Card can be used where you see the Mastercard logo, and comes with a PIN for instore purchases and cash machines. Unlike a credit card, you have to buy the card - At the time of writing, the card costs a one-off £5.99, or you can pay a little extra, and get the card printed with a photo or picture of your choice. We applied for our Freedom card on the 17th of July 2011, and got prompt confirmation by email that he application was being processed, and we'd get out card in 5 to 7 working days. Payment for the card was taken promptly. If you order a pre-pay card from them, it may appear on your credit card as "White Eagle (Europ, Wooburn Green)"
As per the above, despite getting approval over a month ago, still no card. Site message: "Your application is currently being processed. Please login again when you have received your card"
When (and indeed if), we get the card we'd paid for... we'll update this page! As Freedom don't seem in a rush to send us a card for review, we're looking at a competitor - The BREAD Card, a pre-pay Matercard.